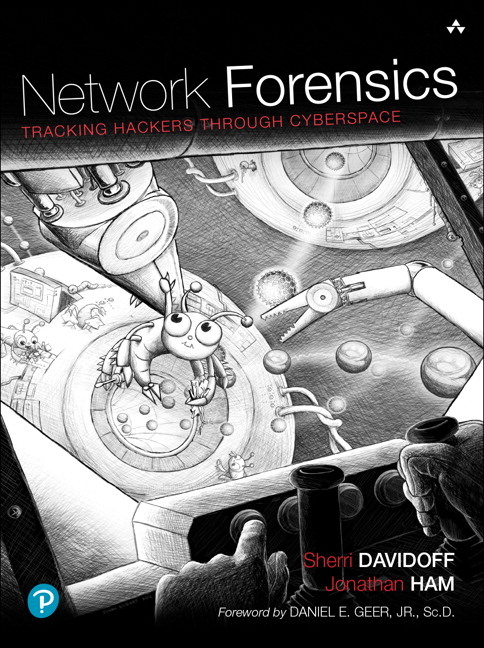 Learn to recognize hackers’ tracks and uncover network-based evidence in Network Forensics: Tracking Hackers through Cyberspace . Carve suspicious email attachments from packet captures. Use flow records to track an intruder as he pivots through the network. Analyze a real-world wireless encryption-cracking attack (and then crack the key yourself). Reconstruct a suspect’s web surfing history–and cached web pages, too–from a web proxy. Uncover DNS-tunneled traffic. Dissect the Operation Aurora exploit, caught on the wire. Sherri Davidoff is a founder of LMG Security, an information security consulting and research firm. Her specialties include network penetration testing, digital forensics, social engineering testing, and web application assessments. She holds her S.B. in Computer Science and Electrical Engineering from MIT. Jonathan Ham has been commissioned to teach NCIS investigators how to use Snort, performed packet analysis from a facility more than two thousand feet underground, taught intrusion analysis to the NSA, and chartered and trained the CIRT for one of the largest U.S. civilian federal agencies. He is a founder of LMG Security. His favorite field is ip[6:2].